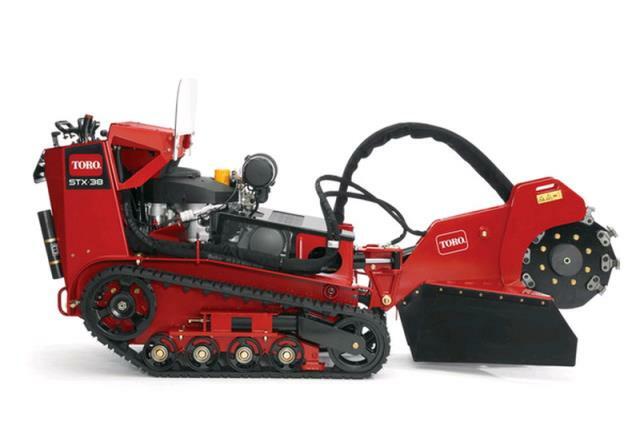 The Toro STX-38 EFI compact track driven hydraulic stump grinder wih Intelli-Sweep, electronic fuel injection and a redesigned cutter head has the best performance and grinding ability on the market. Intelli-sweep automatically adjust the sweep speed of the cutting head based on the load of the wheel so heavy cutting loads wont bog down the engine. 36hp Kohler Command Pro Gas Motor with 21.6" 16 Greenteeth cutting head. * Please call us for any questions on our stump grinder dingo stx 38 hyd prop rentals in Portland OR, Gresham OR, Milwaukee OR, and surrounding metro area.